I don't dress up for Halloween anymore. The last time was a few years ago - I was a wizard. 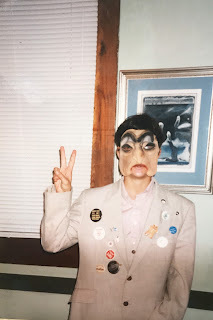 However, I found this darling picture of me from back in the day - I was dressed up as either a crooked political lobbyist from the bowels of some Washington, D.C. think tank or I am just basically your standard Richard Nixon - except I look pretty ragged. Peace out, dudes! And happy All Hallows Eve!